(Reuters) - Gilbert Goh is an unlikely radical. But as anger swells over living costs and immigration in Singapore, one of Asia's richest and most expensive countries, the bespectacled 51-year-old unemployment counsellor is moving beyond the fringe of political activism to the centre of a rancorous debate over the nation's future. In a country where nearly all media are state-linked and open dissent can easily fall foul of the long-ruling government, Goh's call for a public protest on Saturday is striking a nerve. It is also raising the once-absurd prospect of political risk in one of the world's biggest financial and trading centres that has been built on a reputation of stability. Goh set up a Facebook page in early February calling for the protest after the government said the island's population of 5.3 million could grow by as much as 30 percent by 2030, mostly through foreign workers to offset a chronically low birth rate. Since then, more than 5,300 people have said they will or may go to what Goh has billed as a peaceful, non-political demonstration at Speakers' Corner, a park exempt from otherwise strict controls on assemblies in the regimented city-state. Such numbers would make it one of the largest demonstrations since Singapore's independence from Britain in 1963. "We want to have human rights to be able to speak freely without the fear of reprisal," said Goh, a former social worker who runs a support group for the unemployed and ran for election in 2011 for the opposition National Solidarity Party. "I think I have a little bit more guts than your average Singaporean and I love my country a lot." The protest reflects growing disquiet over the vision of the country set forth by the People's Action Party (PAP) that has ruled for five decades. Founded by Lee Kuan Yew, the father of the current prime minister, the PAP is credited with transforming Singapore from a colonial outpost in the 1960s into a global business centre with world-class infrastructure, clean streets, an efficient civil service and the world's highest concentration of millionaires. Part of that success is built on cheap foreign labour and a consumer class full of expatriates. Immigrants make up nearly 40 percent of the population, up from about 25 percent in 2000. But many Singaporeans now struggle to get by on an average monthly wage of about S$4,100 (2,125 pounds). High taxes have inflated the price of the cheapest new car to about S$110,000 and housing prices have doubled in a decade. Fluent in social media, a new generation is openly questioning the ruling party's wisdom. Many are emboldened by a surprising by-election in Punggol East, a relatively young ward where the Workers' Party took a seat in parliament from the PAP last month by a convincing margin of nearly 11 percent. "Many Singaporeans are no longer afraid of the PAP," said Bridget Welsh, an associate professor of political science at Singapore Management University. "The erosion of political support reflects a lack of trust in the leadership. The PAP is following old formulas based on materialism and depending on technocrats for solutions. They've lost the political skills of engaging and persuading." In many ways, the PAP is a victim of its own success. Between the 1970s and 1990s, Singapore was Asia's economic star, growing 8 percent a year on average. Wages, affluence and expectations rose just as fast. Emerging from its top-notch schools, Singaporeans are very accustomed to stability and efficiency in a region beset by graft and polluted megacities. 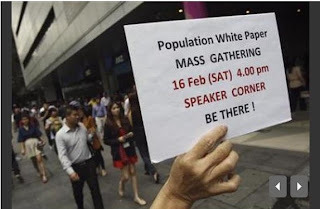 Now online forums bristle with criticism of the government's white paper on population released in January. One number in that document - 6.9 million - set off a debate over how many people can fit onto an island half the size of London and how much the national identity will be diluted. The government insists though that the 6.9 million figure is not a target, but a scenario helping it plan for the future. "The conversation on population does not end today and we do not yet have answers to all the problems," Prime Minister Lee Hsien Loong said on his Facebook page last week as the white paper cleared parliament after a heated five-day debate. "I hope Singaporeans will continue to give us your feedback to allow us to improve our policies and Singaporeans' lives." A senior government official declined to comment on the issues surrounding the white paper. The PAP holds 80 of 87 elected seats in parliament and there is little chance it will lose power in the next general election in 2016. The Workers' Party, despite recent gains, has expressed its desire to work constructively with the government. But gone are the days when political risk was simply not an issue. Stung in 2011 by its worst election showing in history, when 40 percent of voters went against the PAP, the government has become more open in seeking input from citizens and factoring their views into policymaking. To address the discontent, it has restricted the influx of lower-skilled foreign workers and tried to cool property prices. Steps to encourage parenthood include more spending on housing grants, subsidised childcare and cash gifts for newborns. But some question if the government is really listening. "The 6.9 million population plan was an announcement, not a conversation, not debate, not a dialogue," Seth Heng wrote in a Facebook post ahead of Saturday's demonstration. That sentiment is echoed in online forums and the letters pages of newspapers. "Do we really need to increase our population by that much?" Chang Wei Meng wrote in a letter to The Straits Times. "What happened to achieving the Swiss standard of living?" Top factors influencing voters who switched from the PAP in the Punggol East by-election were the cost of living, the government not listening and the affordability of housing, according to a survey by local consultants Blackbox Research. "If this phenomenon is repeated elsewhere, it could represent a real challenge for the government in the run-up to the next general election," it said. Goh, the organiser of Saturday's protest whose Facebook page features quotes from U.S. civil rights leader Martin Luther King Jr. and U.S. President John F. Kennedy, expects the PAP to lose 10 to 12 seats in the 2016 election. The Workers' Party and others are not ready to form a government, he said, but could keep the PAP on its toes. "They have been in power too long to know what to do to change," Goh said. "We still have faith in the government but we want more opposition voices."